I just made up a carpet bag pattern. Playing around with mixing fabrics. This one is a huge weekender size. My first practice one. I will perfect the pattern and then make some to sell. I love the red leather handles! Will add some metal feet to the bottom and a sturdy base board for the interior bottom. Home and relaxing on the couch! Had a super fun time this year at the show. Met some very nice women and had some good laughs! 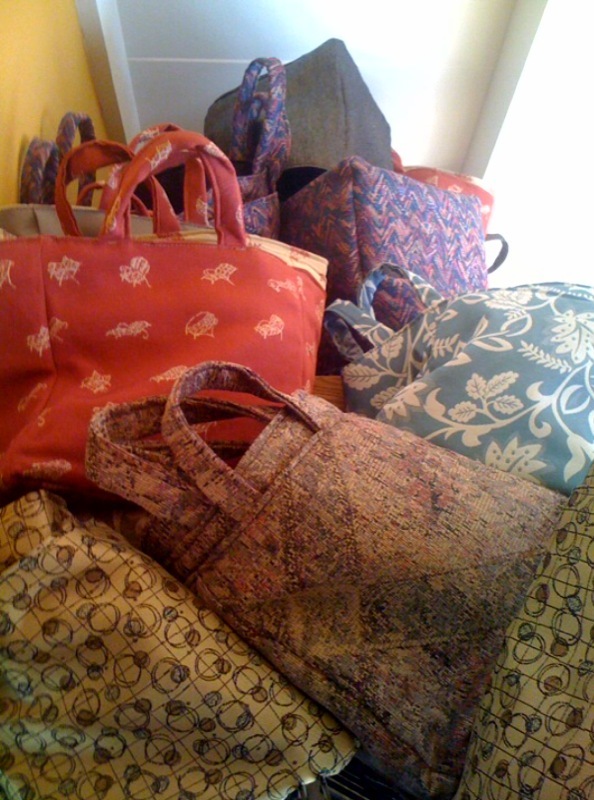 Was also very inspired and re-energized to come up with some very cool one of a kind bags. I need to get back to being the designer/artist that I am. Have been more of a seamstress these last years. Looking forward to working with the nice leather handles, and cool buttons I bought at the show. Come visit me in BOOTH #1241 at Stitches West next week! At the Santa Clara Convention center! I have these new storage containers 11″ square, for storing all your knitting stash or anything else you want to hide away in a pretty container! These retail for $34 each. But at the show if you buy 2 or more you get $5 off each Container Bag! So $29 each! I will be getting back to working on my sewing patterns pretty soon! After the Stitches West Show it will be total immersion into computer work for the patterns! Will be redesigning the covers to give them a fantastic look! Who does not love ETSY! Well probably someone that does not know about this site. I love all the creative peoples art, crafts, fashion, jewelry, etc…. that are for sale on it. It’s such a smartly designed easy to use site. I have been a member selling my work since 2007.